First of all, I have no idea how to spell “traveling.” I have seen it spelled both as “traveling” and “travelling.” The more I look at the word with either spelling, the stranger it looks. Basically, traveling shots in radio are usually a bad idea. The reason they’re usually a bad idea is because many writers write them accidentally, without even realizing that they’re writing a traveling shot, until they get in the studio and the engineer says, what the heck, this is a traveling shot, you do realize how difficult it is to convey traveling shots on radio, dontcha? And they say, well, you did read the script before getting here didn’t you? And the engineer says, um, I didn’t really have time, and the writer says, well then you only have yourself to blame then, don’t you? And then the engineer says, well, the producer should have caught it, and then the producer suddenly jerks awake in his chair and says, what scene are we on…? Well, after I wrote that post, I wound up working on projects that were essentially traveling shot after traveling shot. Clearly people are not reading this blog (for shame!) It bears repeating: do not drink and drive, do not pet burning dogs, and DO NOT write traveling shots for radio UNLESS YOU ARE A FOOLISH, IMPETUOUS RECORDING FOOL LIKE MYSELF! I beg your pardon? You want to know about the “foolish, impetuous recording fool like myself” business? Yes, I was personally responsible for one of the traveling shots. The traveling shot in Canadia, to be precise. 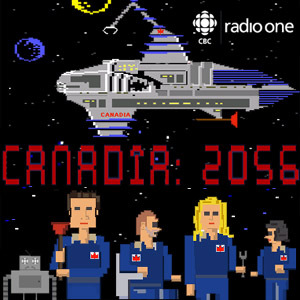 (Canadia being the science fiction comedy pilot I’m producing with my buddy Matt Watts). …but I’ve never built a really good, effective traveling shot for a radio play in a studio. So I said to Matt as we were planning Canadia that I thought it would be neat to attempt a West Wing/Hill Street Blues style traveling shot off the top of Canadia. So obliging fellow that he is, Matt went ahead and wrote one. It so happened that we got busy before the taping, Matt was off to New York to see The Drowsy Chaperone (which he helped write), and we never got to discuss the scene properly before taping was upon us. I had originally thought that I might grab a boom and a Tascam and follow the actors around somehow, but instead I opted to record the actors in place with the rest of the cast swirling around them. During the final mix, I sent Matt off for some sound effects, which meant that he had to pass through five different rooms and hallways, each with radically different acoustic ambiances. On the way, it occurred to him that if we broke the scene up in exactly that manner (several different clearly distinct rooms) that it could be made to work. The scene happens to take place on a starship, where this would make complete sense. Additionally, it’s a great opportunity to take listeners on an acoustic tour of the ship. I also electonically “treated” the actors’ voices depending on their supposed location (as well as the accompanying sound effects)… for instance, in the stairwell, I used a Protools plugin called TrueVerb to make them sound realistically like they were in a stairwell. Although I’m essentially opposed to the use of footsteps in radio (for fear of it becoming “all about the footsteps”), I try valiantly not to be too dogmatic about such things, and reluctantly added a “soupcon” of footsteps here and there just to help sell the movement in the scene. Next time round we’ll plan it better, though, so that the actors know exactly what they’re supposed to be doing when (ie. speaking loudly in the engine room). Although I must say that there is something to be said for their straight delivery, in which nothing is overplayed. Note: Not only was the show greenlit, it ultimately went two seasons, with twenty episodes in total broadcast (twenty-one in total made, with two versions of the pilot).